Sgt. 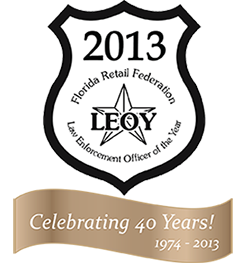 Richard Rossman of the Broward County Sheriff’s Office has been selected as the 2013 Florida Retail Federation Law Enforcement Officer of the Year (LEOY). Sgt. Rossman will receive $3,000 and an attractive custom-crafted medallion and plaque when he is honored at FRF's annual awards banquet on Tuesday, October 8, 2013, at the Omni Orlando Resort at ChampionsGate. His name will be added to a plaque that lists each LEOY recipient since the program’s inception in 1974. Names of the 2013 Runner-Up and Honorable Mentions will be released pending notification.